Are white LGBT people really less racist than their cisgender, straight counterparts? 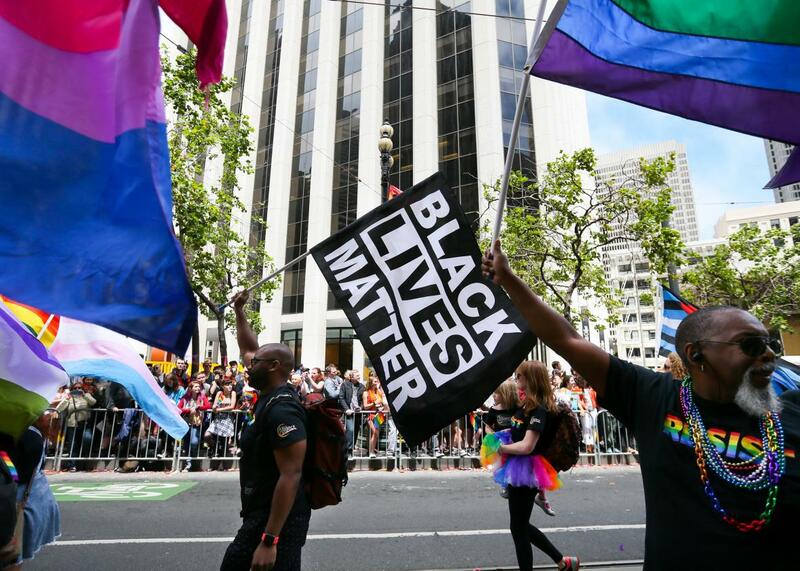 Participants wave rainbow and ‘black lives matter’ flags while marching in the annual LGBTQI Pride Parade on Sunday, June 25, 2017, in San Francisco, California. For black and brown people in the U.S., racism is sadly a part of our daily experience. Whether we choose to cope with it, ignore it, or aggressively fight back, it’s always there—at work, in school, and in our own neighborhoods. But as a queer black man, nothing is more frustrating than when the racist rhetoric and actions come from within my own LGBT community—and believe me, it happens all the time. A recent article, however, would have us believe that there is minimal racism within the LGBT community, at least when compared to our heterosexual counterparts. While the author’s analysis comports with the survey he draws from, it does not reflect the reality of queer people of color’s experience. And worse, it may give white queers a false sense of accomplishment, when they should be focused on ridding themselves of their own indoctrinated biases that harm LGBT people of color. On July 7, the Washington Post published, “Yes, there’s racism in the LGBT community. But there’s more outside of it.” Andrew Flores, assistant professor at Mills College, examined the 2016 Cooperative Congressional Election Survey (CCES), which included questions addressing the respondent’s sexual orientation and gender identity. The CCES is a large survey comprised of 64,600 interviews. The 2016 survey included 4,946 individuals who self-identified as lesbian, gay, or bisexual, and/or transgender—making up 8.8 percent of the weighted sample. But while white privilege is easy enough to acknowledge, that doesn’t necessarily mean white folks are doing much to counter it. We know people of color and white people within the LGBT community have varied reactions to racism, and they are rarely the same or similar. For example, when the city of Philadelphia added black and brown to the rainbow flag—a symbol of solidarity created by Gilbert Baker in 1978—earlier this summer, arguments erupted about why there was even a need for the addition of these two colors. But for many black and brown LGBT people, the addition helped make clear that the LGBT community is more intersectional and diverse now, and not just the province of cisgender, wealthy, white men. Some LGBT activists, nonetheless, protested that the addition was divisive. These protests were not from LGBT people of color. Further, LGBT people of color are constantly speaking out about racist experiences at majority-white gay bars and the lack of inclusive safe spaces. In September 2016, Darryl DePiano, owner of Philadelphia gay bar iCandy, was caught on camera referring to several black patrons as “niggers.” And, in Washington, D.C., it was revealed in Mic that the owner of J.R.’s demanded that Aram Vartian, then a graphic designer at LGBT publication Metro Weekly, use a “hot white guy” on a promotional flyer instead of a black man to please his clientele. These are not isolated instances—many similar ones go unreported—and they are part of the same kind of racism that plagues gay social apps like Grindr and Scruff. But this survey and Flores’ column, well-intentioned as they might be, are not designed to capture the real situation. What’s deeply troubling is that many white LGBT people will use this headline to excuse themselves and their friends, patting themselves on the back instead of intentionally practicing anti-racism. Moreover, LGBT people of color will have their experiences with racism questioned as either exaggerated or untrue. Both are false. The question becomes: If a person acknowledges privilege, then what? Do you give up a cushy job? Do you promote a LGBT person of color to senior management? Or, do you just fill out a survey result and sit back smiling at the recognition?